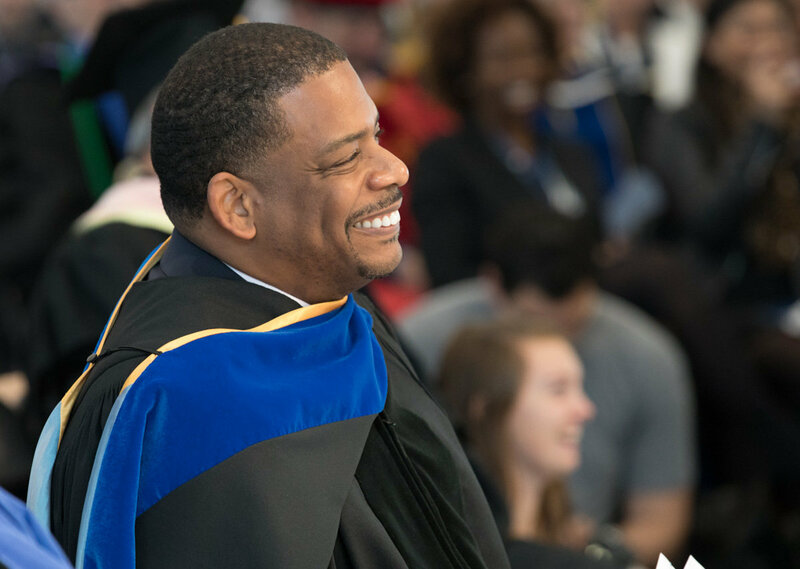 Before an arena packed with thousands of students, faculty, staff, alumni and distinguished guests from across the country, Shirley M. Collado was inaugurated as the ninth president in Ithaca College’s 125-year history on Saturday, Nov. 4. Collado is the second woman to hold the office, and the first person of color. She is also the first Dominican American to be named president of a college in the U.S.
Board of Trustees Chair Tom Grape ’80 formally installed Collado, placing the symbolic medallion of office around her neck. 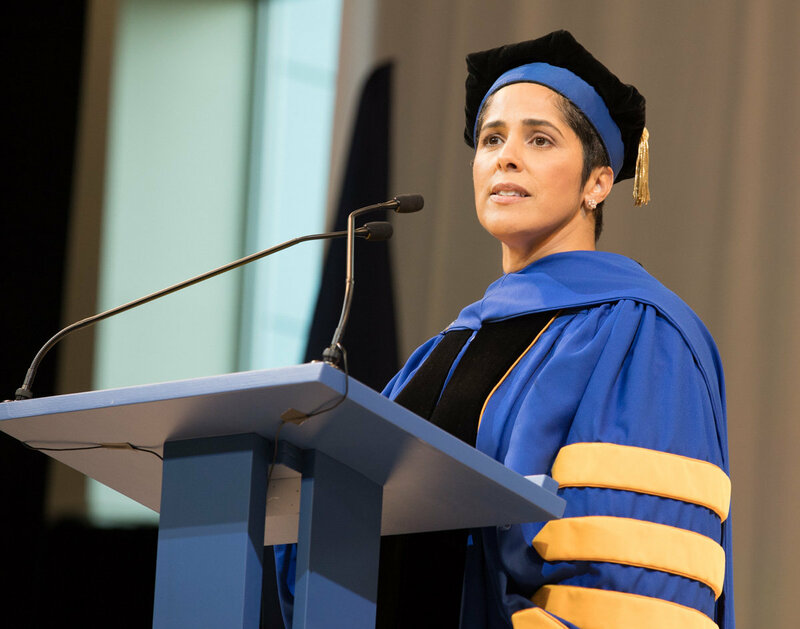 In her inaugural address, Collado envisioned an Ithaca College that continues to be a trailblazer in the shifting landscape of higher education and empowers all of its students to learn, grow and serve the public good. Throughout her address, Collado drew connections between Ithaca College’s past, present and future. The key to its continuing success, she said, lies in the three educational elements emphasized at the college’s founding in 1892 as the Ithaca Conservatory of Music: theory, practice and performance. Collado described theory as the underpinning of the pursuit of knowledge. The college’s identity as an intimate, residential college and learning community sets it apart from larger institutions. “Here, we don’t simply study theory. We live it,” she said. Practice, Collado explained, requires the ability to take risks and challenge long-held assumptions. She said that when institutions of higher learning fail to take risks or broaden their scope, they fail society, perpetuating narrow world views and disengagement. She noted that many students, such as participants in the Deferred Action for Childhood Arrivals immigration program and first-generation college students, must fight harder for a seat at the table. Ithaca College, then, must provide a “brave space” for all students to practice intellectual inquiry. She called upon the college to build an educational model that tears down barriers to access, as well as barriers to dialogue and shared learning. “When boundaries disappear, we can realize the full potential of a residential college campus where everyone is welcome to practice deep intellectual inquiry, and everyone is empowered to collaboratively create and consume knowledge,” said Collado. The college can achieve that goal, Collado said, by pursuing an innovative student experience on campus while drawing on its connections within the Ithaca community and its strong alumni network. Collado’s inauguration was attended by a variety of distinguished guests, including representatives from higher education institutions and organizations from across the country. They joined with representatives of IC faculty, staff, students and alumni, along with local community leaders, taking turns greeting the new president on behalf of their constituencies. Jordan was introduced by writer Julia Alvarez, a 2013 recipient of the National Medal of Arts. Collado cited Alvarez as an inspirational figure, and the first author who gave voice to her experience as a Dominican woman. Alvarez praised Collado’s inclusive style of leadership. Freeman A. Hrabowski, president of the University of Maryland, Baltimore County, who Collado credits as a mentor, spoke about the role of colleges and universities teaching the values of civic engagement, rational thought and critical thinking. He said that it is a responsibility of all in higher education. 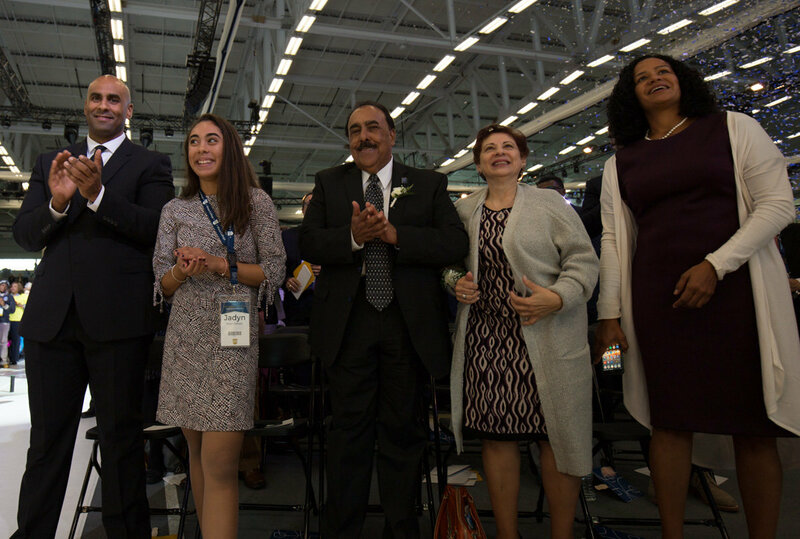 “We as educators — not just presidents, but faculty and staff — have this responsibility to teach our students and prepare them to become what [Louis] Brandeis says is the most important role in our society — of being a citizen,” said Hrabowski. Recollecting the history of Ithaca College, Collado noted that the first graduating class of the music conservatory was entirely female, and that at the time one of the only professions open to women was teaching music. She said she felt a connection with the first known student of color at the conservatory, 1912 graduate Clarice Jones. At the conclusion of her address, Collado noted that the celebration of the college’s 125th anniversary was a celebration of the college’s evolution. She acknowledged that evolution is often used to justify oppression, but forcefully rejected that path for Ithaca College.